Spring time makes me giddy! There are so many different kinds of spool knitting tools available. When I was a kid, my mother made me one by nailing 6 brad nails into the top of an old spool of thread. It worked like a charm. 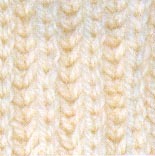 Today, I used an Caron Embellish-Knit! Machine Kit . A quick search on the Internet for "spool knitting" will lead you to many places where you can buy spool knitting tools, or you can do like my mother and make your own. The size of yarn that you use will depend on the number of nails and the size of the spool center hole. I won't go into detail on how to make the spool knitting cord. There are a ton of instructions and videos online on how to do that if you need help. One that I found quite useful was Bob Lafara's Crafts. Make the cord as long as you like. 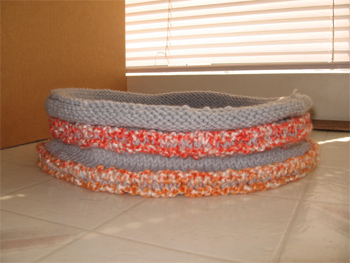 You can make the Snuggle all in one cord or you can make multiples of different colors and sew them together. 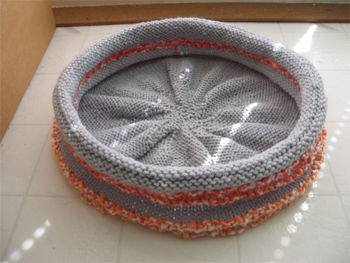 To make the Snuggle, just coil the cord into a circular pattern and sew the adjacent loops together. Finish off by sewing any loose ends into the cords.